Each column represents one week and each row represents a different "key performance metric." These are the actual numbers from my business this month. You've probably heard the saying, "What gets measured gets done." It's absolutely true in relation to your coaching business. If you don't stay focused on your most important metrics each week, you're more likely to creatively avoid the things that actually get clients and make money. Another benefit to tracking your "Key Performance Indicators" (or KPIs) is that they help you understand what areas to improve in your business. For example, if you're having a lot of sales calls but aren't getting many clients, you need to work on your enrollment skills. The final benefit of tracking your KPIs is that they turn your coaching business from something that feels deeply personal into an external game that you can win. This keeps you focused on the process instead of the outcome. Okay, so you're sold on the idea of tracking your KPIs. What numbers should you keep track of? There are a lot of things that you could choose to track in your business. Website visitors, referrals, etc. The problem with tracking too many numbers is that it diffuses your focus and defeats the purpose of tracking things in the first place. 1. Email subscribers OR reach-outs. This depends a bit on what stage of business you're in. If you've already started building an audience online, and the majority of your leads come from your email list, then I want you to focus on increasing subscribers. If you're just starting out, and the majority of your leads come from direct reach-outs (from live events, referral partners, social media, etc. ), then I want you to track those. 3. New clients. Each time you sign a new client, meaning they actually pay you, write that down. I personally break this one out into two rows because I have two different offers that I want to track separately: my high-end mastermind and my low-end course. So if you have two offerings that are different enough to justify breaking them out then that's fine, just make sure you have a reason for it. 4. New sales. What I want you to track here is the amount of new sales you closed that week. If you got paid upfront for a certain package, then just write down the amount you got paid. If you got paid for the first month of a multi-month agreement, then write down the full amount of that agreement (for example you'd write down $6,000 for a 6 month agreement even if that person is paying $1,000 per month). Only do this if the new client has committed in writing to that time frame and you have them set up for automatic monthly payments (you can use Stripe for this). We want to focus on a) the things that matter and b) the things that we can control. The number of website visitors doesn't really matter. It's indirectly related to email subscribers, but it's really more of a vanity metric. On the other hand, something like revenue matters because it's what determines whether you get to stay in business. But if we tracked revenue instead of new sales, it would end up including sales we made in the past from clients who are paying monthly. We want to know how we performed this week so that we can figure out where to improve. Just tracking your KPIs alone will be motivating and it will help your business. But the real benefit comes in when we look at what story those numbers are telling. New subscribers/reach-outs. If this number is low, it means you need to put yourself out there more. You're not generating the awareness that you need in order to fill your pipeline. Focus on things like writing and promoting content, networking online and in person, clarifying your specialty, and following up with people who you think you can help. Here are the three types of places to find potential clients. Sales calls. If this number is low relative to the number above, there could be a few things going on. First, you might not be inviting enough of the people you connect with to free consults. Second, you might not be connecting with enough of the right people. Third, you might not be framing your free consult in a way that's compelling for them. 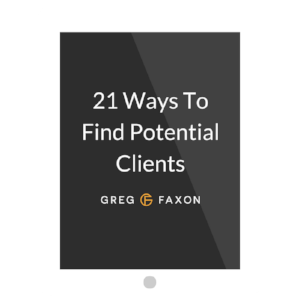 This article will help you fill your calendar with potential clients. New clients. When you divide the number of new clients you got by the number of sales calls you had, that gives you your conversion rate. At this point my marketing is pretty dialed in and I'm picky about who I talk to - so my conversion rate is high. But even if you're only converting 1 out of every 4 potential clients you talk to (a 25% conversion rate), you're in good shape. A 30% conversion rate is great and a 50% conversion rate is phenomenal. If you're seeing those types of numbers then you need to focus more on the other metrics. Otherwise, here's a framework for you. New sales. This number speaks to how much you charge. If you have low prices or you don't enroll people into long-term packages, you're going to have to constantly be getting new clients to make a living. So if this number is low relative to the other ones, you either need to start charging more or you need to enroll people for longer periods of time. Here's an article on how to double your prices. 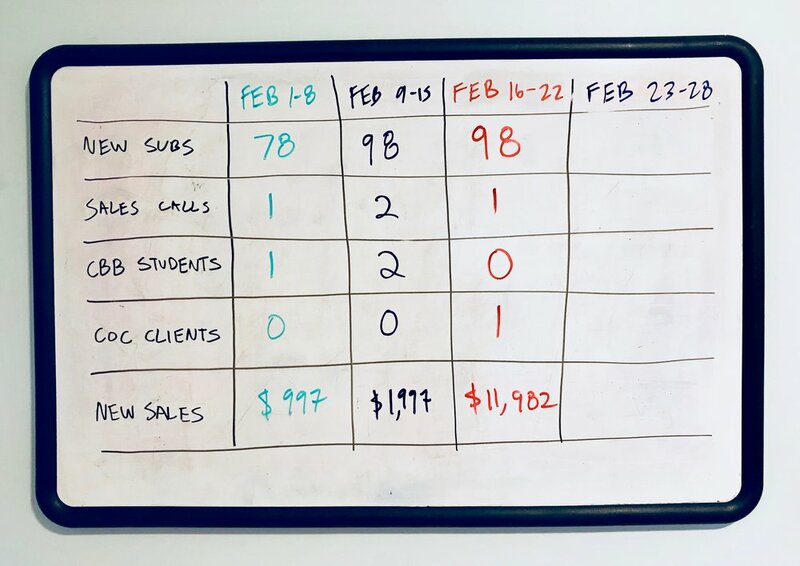 Now that you've learned about the four key numbers to track each week, I want you to create your own "visual tracker" on a white board or piece of paper and put it where you'll see it each day. It's also great to have a digital version of this in a spreadsheet so that you can track these KPIs over time, but that's not something that you're going to be looking at every day. You need something you can see. Update your visual tracker throughout the week and then add it to your digital spreadsheet at the end of each month. Notice the story that those numbers are telling. Then clear those bottlenecks and try to increase your numbers every week. The pattern that I see for most coaches is that they have trouble with the first two numbers. In other words, they have trouble getting leads and booking sales calls. Hope that helps! Now get to tracking those numbers and let me know how it goes.